At Minerva we believe that you should set the direction for your education within a flexible framework. Your coursework is deliberately structured to impart a versatile and powerful set of cognitive abilities, enable exploration across diverse fields, and foster mastery in your selected area of concentration. Because the world is rapidly changing — with societies and industries becoming increasingly interconnected — many of today’s careers will become obsolete, as new ones are invented or emerge organically. This new reality mandates a new approach to specialization, wherein any area of expertise must also provide the flexibility to adapt. That is why majors at Minerva are different from those offered at other universities. You can choose to earn your undergraduate degree in five accredited colleges — Arts & Humanities, Business, Computational Sciences, Natural Sciences, and Social Sciences. Within each of these majors, are six concentrations that are more focused specializations in each field. The majors at Minerva are conceived as an interrelated matrix of courses, wherein every class offered is essential to one of the five fields. You are fascinated by the diversity of human expression — language, philosophy, literature, politics, ethical and legal systems, the arts, and world cultures. From public policy to publishing, the Arts & Humanities major allows you to explore a wide range of pursuits and nurture your own creative potential. 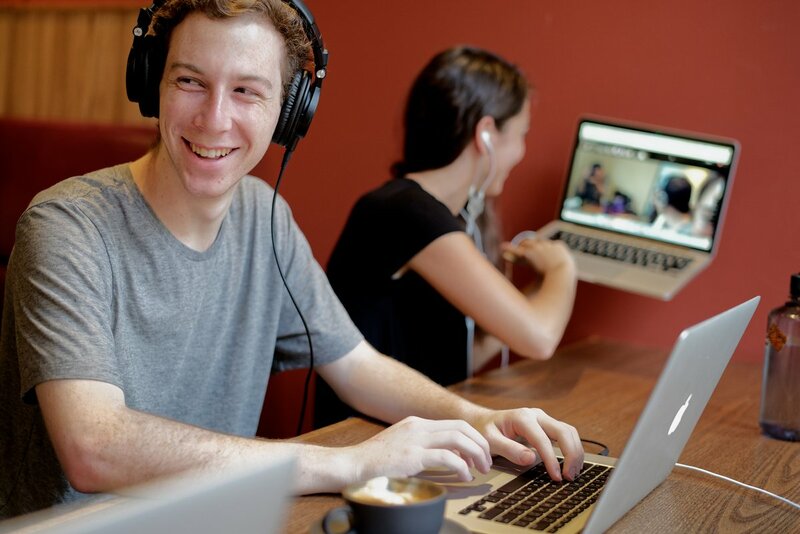 Yoel Ferdman, USA, and Ailén Matthiess, Argentina, attend class from a San Francisco café. The arts and humanities take the history of creative human thought and expression and apply it to understanding and contextualizing events, ideas, policies, and human relationships. They foster an appreciation for other ideas, eras, and cultures, as well as the development of new ideas and new ways of looking at the world. The Arts & Humanities major helps you become a better thinker, leader, innovator, and informed global citizen with a social conscience and the ability to implement your ideas through persuasive communication in different media and formats. As an Arts & Humanities major, you are required to take the courses that provide a foundation the Arts & Humanities concentrations, as well as electives from courses offered in other majors. In addition, you will complete additional elective courses, senior Tutorials, the Capstone courses, as well as the Manifest term. Understand the impact of historical forces by acquiring the analytical tools of historians to solve the challenges posed by a wide range of historical problems and contemporary issues. Learn about comparative methods to analyze the effects of various forces on different societies. Explore how to use history as an instrument for informing public debates on contemporary issues. Approach the arts, literature, history, ethics, law, and philosophy from an analytical perspective. Learn how to interpret the arts and literature deeply, using careful observation and appropriate theoretical approaches. Apply the methodological tools of the historian to interpret the past as well as the present. Examine the theoretical frameworks of ethical systems to understand their relationship to legal systems and contested moral issues. Delve into the origins of moral beliefs, the relationship of ethics, and law, and study the relevance of all three to decision-making. Learn about the theoretical frameworks you can bring to bear when addressing moral issues and investigate how ethical and philosophical analysis may be used to change political and social institutions for the better. Examine the humanities by putting them into their social, cultural, political, and economic contexts. Investigate the divergent responses of different societies to the challenges they face. Understand the evolution of the arts and literature around the world, within their socio-economic, political, and cultural frameworks. Understand how and why our notions of ethical and legal systems, as well as their applications, have changed in response to new ideas about the role of individuals and institutions in society. Acquire a variety of analytical tools to interpret works of art and literature. Explore how the arts and literature interact with the larger society around them, how they are influenced by economic, political, and social forces, and how, in turn, the arts and literature can be used to communicate effectively and persuade others to bring about change. Explore the uses of history, ethics, the arts, and literature to understand the past, influence the present, anticipate new developments, and persuade cultural, social, political, and economic actors and institutions to modify their plans for the future. You recognize business as a powerful force for global change. From early-stage funding to strategic planning, corporate restructuring, and global supply chains, the Business major teaches you the principles and practices of effective organizational leadership. 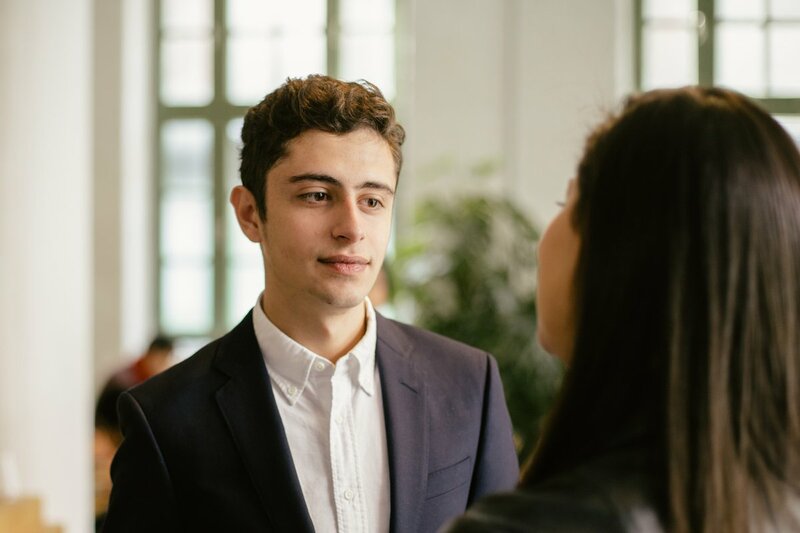 Guilherme Nazareth de Souza, Brazil, speaks with a classmate during a Minerva-hosted event. Private enterprise is one of the world’s primary drivers of wealth, employment, technological advances, and social progress. Effective business leaders need an understanding of corporate and market dynamics, the strategy and mechanics behind transactions, and the operational complexity involved with turning a local success into a global enterprise, or taking a new idea from proposal to profitability. The Business major prepares you for leadership and innovation in top global organizations. As a Business major, you are required to take the courses that provide the foundation for the Business concentrations, as well as electives from courses offered in other majors. In addition, you will complete additional elective courses, a Business practicum, the Capstone courses, as well as the Manifest term. Delve into the elements required to successfully move businesses through the earliest stages of formation and establishment of market traction. Explore critical questions in business and market analysis for new product introduction, start-up finance, the elements of contracts and sales, and how to successfully manage in highly constrained environments. Learn the critical aspects of successfully navigating businesses through various trajectories of growth, as they galvanize success in existing markets and enter new ones. Explore both internal factors such as capital allocation and supply chain management, and external factors such as market penetration and complex partnerships. Deeply examine the complexity of managing and optimizing a multinational corporation. Explore the systems necessary to operate a business at scale, from workforce optimization to leveraging investments to managing the brand. Learn how to use mergers, acquisitions, divestitures, debt, and financial engineering as tools to salvage businesses, while tackling difficult corporate challenges, such as brand repositioning and cost optimization. Master the processes, tactics, and tools that businesses utilize during various stages of growth, from the general manager’s perspective. From ideation to start-up, from domestic to international, from market follower to market leader, learn the theory and practice behind effective brand management. Learn how to allocate and preserve funds to make informed decisions; understand how to utilize financial instruments to successfully manage a growing enterprise. Gain rigorous financial modeling and budgeting skills; learn the success tactics of great CFOs, the accounting principles necessary for effective corporate management, and the optimal utilization of various assets to maximize corporate returns. Study how to balance an intricate array of constituents, systems, and environmental factors throughout the stages of business growth. Learn advanced modeling tools and specific strategies for managing large employee bases, navigating multinational laws and regulations, creating scalable IT infrastructures, and optimizing global supply chains. You were born to invent the next disruptive algorithm. From robotics, artificial intelligence, and machine learning to big data, the Computational Sciences major prepares you for a future of technological innovation and life in the information age. 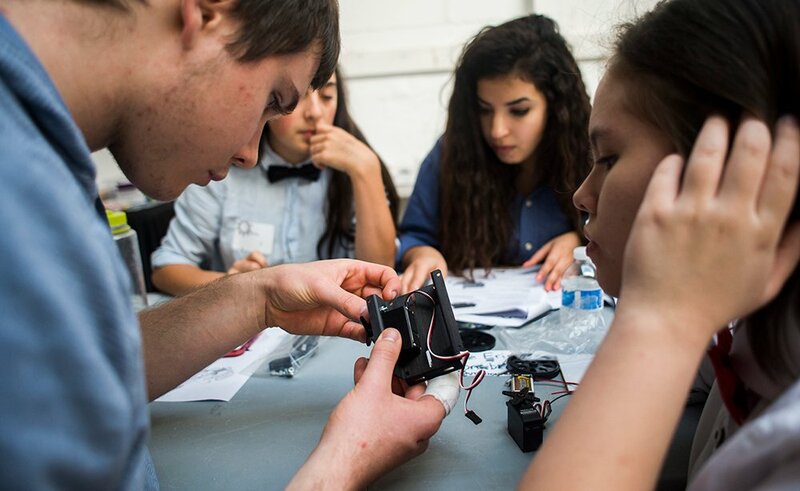 Minerva students assemble their robots for the annual Sumobot co-curricular event. Computational sciences provide the scientific foundations for making sense of natural, human-mediated, and social phenomena through analytics, computational methods, and modeling. In an age of ubiquitous — and often overwhelming — data, the ability to harness that data to reflect, reach out and make better decisions is increasingly crucial. The Computational Sciences major prepares you to use logic and data analysis to make informed decisions and solve complex problems. As a Computational Sciences major, you are required to take the courses that provide the foundation for the Computational Sciences concentrations, as well as electives from courses offered in other majors. In addition, you will complete additional elective courses, senior Tutorials, the Capstone courses, as well as the Manifest term. Investigate the range of technologies, products, and services that rely on computer science and artificial intelligence at their core. Learn to analyze, design, and manage the processes and systems that govern their utility to the world. Investigate the range of technologies, products, and services that rely on computer science and artificial intelligence at their core. Learn to analyze, design, and manage the processes and systems that govern their utility to the world. Explore the foundational theories at the heart of computational sciences and learn to appropriately apply deep analytic methods and techniques from the various computational disciplines. Investigate the ways in which mathematics and operations research are used to analyze and address complex problems. Understand the processes and techniques to appropriately apply these disciplines to real-world challenges. Learn to identify emergent patterns, use those patterns to define structure and systems, and analyze the results. Specialize in the process of applying computational and quantitative methods to identify the structures shaping the world around us. Examine how data science and advanced statistical analysis are quickly becoming key enablers of economic success. Acquire the skills used to analyze, design, and exploit the methodological infrastructure and technologies required to deal with, and effectively interpret, massive amounts of data. Understand how to apply computational and quantitative methods to mitigate or solve many of the daunting problems the world faces in the 21st century. Gain the ability to apply these methods to characterize in detail, then devise tractable approaches to solving, complex challenges. You are driven by a passion for improving life on earth — even extending it. Whether global health, ecological degradation, or exploring the universe, the Natural Sciences major gives you the tools for understanding the diverse components of our natural world and using that knowledge to affect meaningful change. Xiaotian Liao, China, takes class from the Minerva residence hall in San Francisco. Scientists and engineers use theories and findings of the physical and chemical sciences as well as the biological and biomedical sciences to develop new technologies, improving the lives of millions of people around the world. Making effective decisions in many technology-oriented organizations requires a deep understanding of the natural sciences. The Natural Sciences major gives students the practical knowledge to become leaders and innovators in science and technology-based organizations. As a Natural Sciences major, you are required to take the courses that provide the foundation for the Natural Sciences concentrations, as well as electives from courses offered in other majors. In addition, you will complete additional elective courses, senior Tutorials, the Capstone courses, as well as the Manifest term. Understand the chemistry and physics of matter — the basis of all processes on earth — from particles to atoms to molecules. Learn the latest analytical methods for probing this miniature world and explore the technologies that are being used to address global health and environmental challenges. Analyze and interpret the latest knowledge in physical, chemical, biological, and earth sciences, from the smallest-scale particles, atoms and molecules, to cells and organisms, to the complexity of the earth's systems. Delve into the essential questions at the center of scientific pursuits. Examine the complexity of how cells and organisms function, and learn sophisticated techniques for probing the mechanics of life. Explore how the principles of biological design are informing and inspiring engineering disciplines. Learn how biotechnology and bioengineering can yield solutions to many of the challenges affecting life on earth. Explore in detail how research is practiced across the molecular, cellular, and earth systems levels. Learn about the latest experimental methods, practices, and tools, with a focus on how these can advance understanding and pave the way toward technological solutions to daunting global problems. Investigate the interactions among earth's systems, including atmospheric, terrestrial, and marine components. Learn how the earth's biome — including humans — interfaces with the physical, chemical, and geological aspects of the environment. Explore the scientific approaches used to monitor and model changes to our planet, and potential technological and social solutions to environmental challenges. Investigate the complex environmental and health challenges facing our world in the 21st century. Research potential technological solutions informed by and affecting multiple scales — from molecules to organisms to earth's systems. You are inspired by elevating the human condition. Through deep inquiry into topics like individual responsibility, the role of government in a free society, and global economic reform, the Social Sciences major prepares you to tackle injustice, reduce inequality, and strengthen the world’s diverse communities. 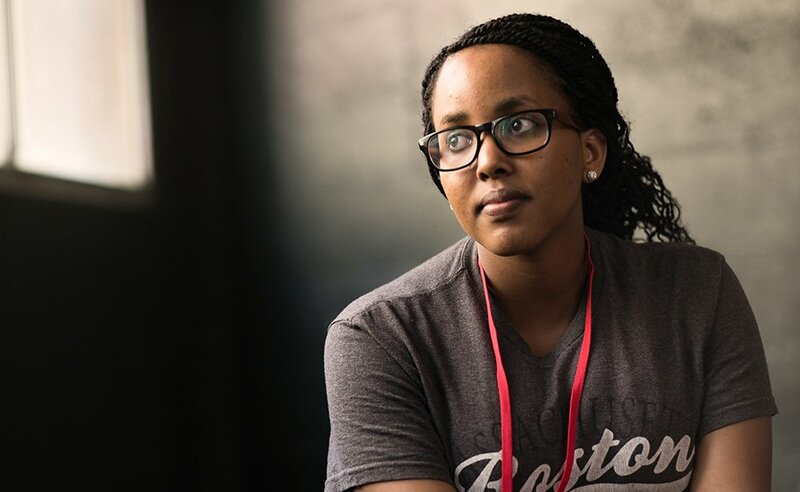 Fabiola Kabera, Rwanda, listens to one of her classmates speak during a group discussion at Civitas, a Foundation Week event. The social sciences apply the methods of science to understand the ways people think and act — individually, in groups, and in societies — and the ways that biology and the environment interact to make each of us unique. Research findings from the social sciences inform public policy on a wide range of issues, such as reducing crime, designing effective political campaigns, helping people overcome addictions, crafting economic/labor policies, and convincing people to conserve resources. The Social Sciences major prepares you to analyze and solve myriad complex societal challenges. As a Social Sciences major, you are required to take the courses that provide the foundation for the Social Sciences concentrations, as well as electives from courses offered in other majors. In addition, you will complete additional elective courses, senior Tutorials, the Capstone courses, as well as the Manifest term. Learn how to use cognitive science to illuminate questions about the mind, including what the nature of thinking and emotion how the two interact in human beings. Investigate the anatomy, physiology, and chemistry of the brain, how they relate to the mind, and what implications brain science more generally has for society as a whole. Explore how to use the science of psychology to become a more effective member of society: to be more persuasive, set better goals, lead effectively, and promote positive behavior changes in yourself and others. Understand the various theoretical approaches in social science, and learn how to use these approaches to analyze the individual mind and emotions, the community, and interconnected global economies and governments. Learn how to develop and test such theoretical frameworks in order to apply them to a spectrum of social issues. Study the nature of capital, trade, taxation, economic growth, and the scientific analysis of economies. Learn the various tools and theories used for analyzing economic behavior. Understand the powerful ways in which local, national, and global economic activities impact the lives of world citizens, at every socioeconomic level. Learn fundamental concepts and methods across a range of topics in social science, including human cognition, group behavior, economics, and global political systems. Compare and contrast the tools of discovery in these various domains and learn to interpret the findings produced by these tools. Investigate the factors that influence and define successful governments. Understand the ways in which distinct political systems influence citizenry in different places and times. Learn the elements of effective constitutional design and implementation. Devise ways to improve society, based on the science of influence and motivation, the challenges facing developing and developed economies, and the central components of government constitutions. Envision an ideal social order at the local, national, and global level and learn how to be a leader who develops guidelines — from ethical frameworks to legal policies — that would shape and support such a society.